I like eggs. A lot. So I’m always working to improve my egg-making. A while back I blogged about my herbed eggs and greens, where I showed you my high-heat, quick-scramble technique. 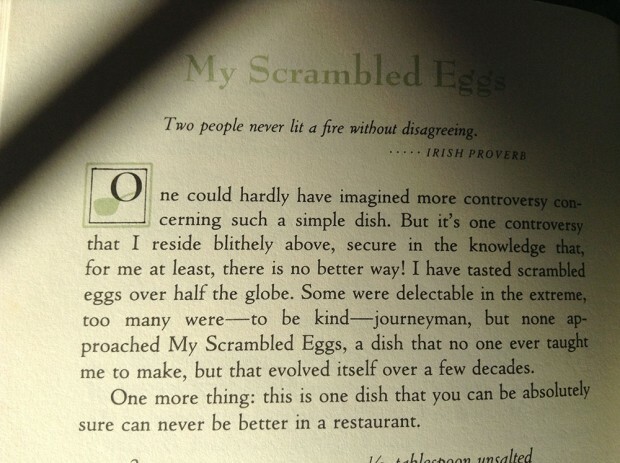 Since then, I have changed how I scramble eggs, thanks to Malachi McCormick’s Irish Country Cooking, a wonderful cookbook with traditional and modern Irish recipes and, like all good things Irish, full of history and stories and proverbs. 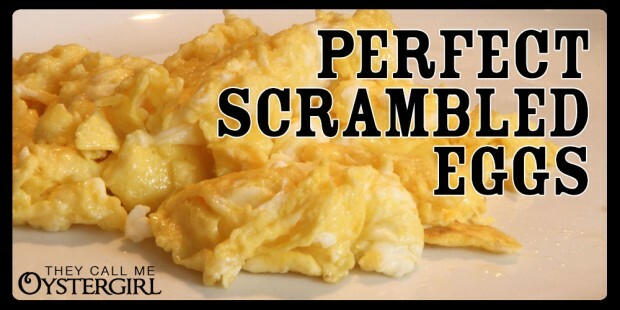 His recipe is very simple, calling for eggs, water (1 tablespoon for each egg), butter (Kerrygold, no doubt), and a pinch of salt. The second secret is to cook them slowly, over low heat, and to push the cooked bits into the center of the pan, so the uncooked portion will flow to the outside to be cooked. Also, stop cooking the eggs just before they are done: They will finish cooking on their own, and you do not want them overdone. A little runny is good. This morning I made some with homemade chicken broth, caçoula (pork in lard, wine, and spices) from Fall River, and my mom’s homemade kimchee (fermented cabbage, garlic, ginger, and pepper). Is this what they call fusion cuisine? 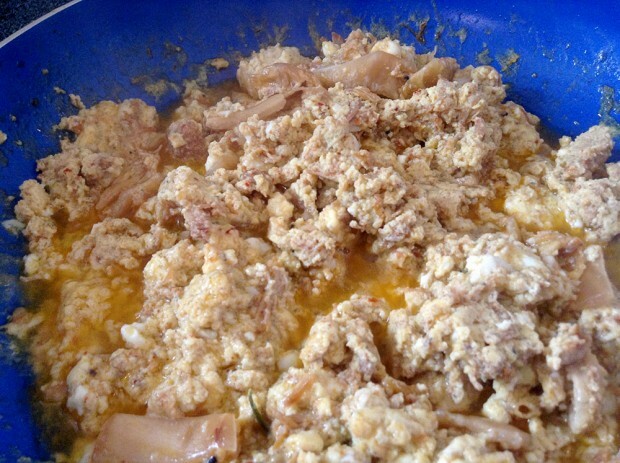 I would never think of adding kimchee and cacoula to eggs.Interesting! I do use water instead of milk, the eggs are definitely lighter. 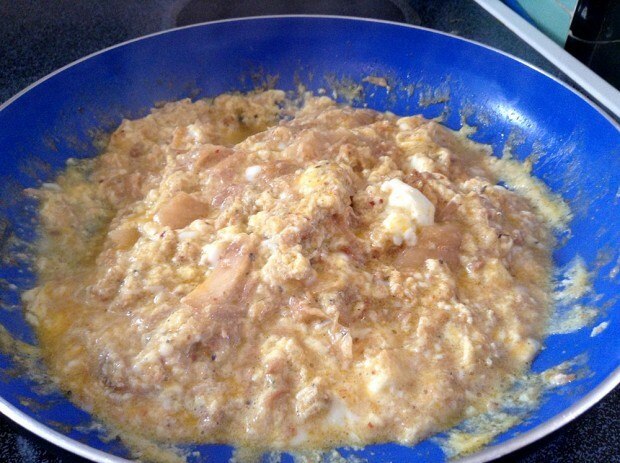 I add pepper and a teaspoon of dijon to my eggs too. Incorporating the other ingredients after the eggs start to firm up keeps the eggs from absorbing all the color from the other ingredients.I like a veggie scramble, with mushrooms, onions and spinach. Saute the veggies first, then remove from pan, wipe the pan clean and scramble the eggs, until nearly done and then mix in the cooked veg. So tasty and less to clean up afterward. Kevin, this sounds YUMMY–especially the mustard, I will be trying that! 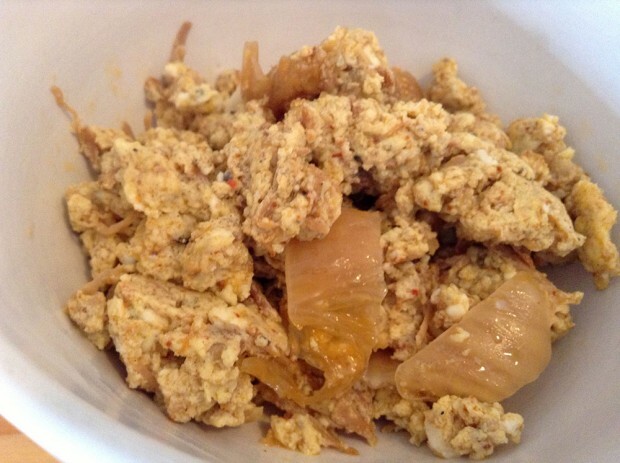 The evolution of the kimchee and cacoula was this: I got this new cacoula and scrambled it with our morning eggs, and we agreed that it was a little dry and bland. 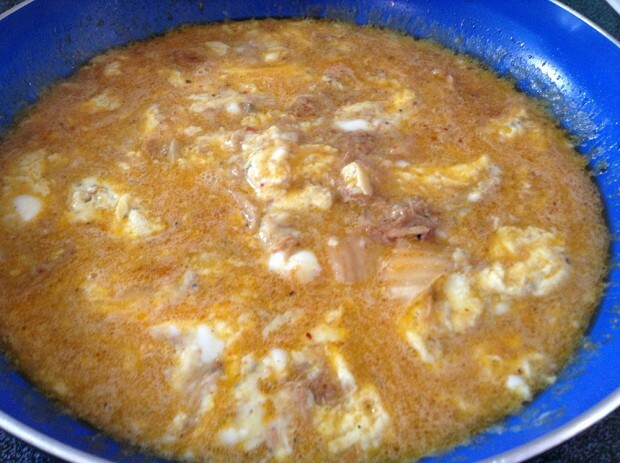 Hence the broth, for moistness, and the kimchee for flavor (eggs scrambled with kimchee is a favorite and kimchee is often served with pork, which is why it came to mind). what kind of skillet is that? It’s this weird new-technology diamond skillet that someone gave us. It’s kind of scary! I need to use cast-iron more. just wonderin’.. .i use cast iron.. curious about anondized aluminum. I don’t know much about the science of it actually, except I remember hearing how horrible teflon is, which makes me imagine that any new technology is evil. I’m not actually a neo-Luddite or conspiracy theorist but sometimes I think like I am.